You may have trouble finding the best Japanese eye cream because many high quality products from Japan are not popular outside the country. This is because Japan does not really focus on international markets unlike Korea with its cosmetic products and idols. Honestly, I believe Japanese eye creams are among the best because I always see good results using them. It is a shame that most of them are not very popular outside of Japan. Maybe Pola is not very well-known in other countries, but it is a very popular brand in Japan which has a very good reputation due to its high quality products that deliver results. BA is a luxury brand by POLA which is based on bioactive theory that focuses on the original strength of skin. This skincare line believes that “pulling out the power of each cell is the origin of beauty” . In line with its belief, Pola BA The Eye Cream works on the entire dermis to fight signs of aging. It contains Akebia Shoot Extract to increase blood circulation and minimize dark eye circles. In addition, the eye cream contains Shell Ginger Leaf Extract that produces bonding collagen cells. So effective is this eye cream that it became the Winner of 12 International First place Awards. It is highly rated on @cosme (the biggest Japanese beauty site) with many glowing reviews. The eye cream is effective to reduce sagginess. After using this eye cream, the skin will evidently feel firmer and lifted. This eye cream would last you 2 months if you apply it twice daily (morning and night). After 15 years of research on how wrinkles are formed and how to treat them, Pola released the Pola Wrinkle Shot Medical Serum in January 2017. Approximately 620,000 pieces was sold in just 6 months from its launch. Pola Wrinkle Shot Medical Serum is classified as a quasi-drug which is an intermediate category between cosmetics and drugs. Quasi-drugs are medical-grade products which contain active ingredient(s). In the case of Pola Wrinkle Shot Medical Serum, the active ingredient is the newly developed Sodium [[[trifluoro-isopropyl-oxopropyl]aminocarbonyl]pyrrolidinyl]carbonyl]-methylpropyl]aminocarbonyl]benzoylamino]acetate, which is also known as NEI-L1. Pola Wrinkle Shot Medical Serum has received the world’s first approval for medical-grade wrinkle cream. Pola discovered that wrinkles are exacerbated by mild, prolonged inflammation such as UV rays, dryness, and facial expressions. It was found that the inflammation in the dermis causes a type of lymphocyte known as neutrophil to secrete a lot of neutrophil elastase which destroy collagen and elastin, which leads to the formation of wrinkles. The active ingredient, NEI-L1, helps to inhibit the activity of this enzyme. As to how effective this product really is, just take a look at the photo above and observe the nasolabial folds (the 2 deep lines around his mouth). This man applied the Pola Wrinkle Shot Medical Serum on only one of his nasolabial folds for 8 years and it looks obviously less deep compared to the other nasolabial fold. This shows that this product is very effective even for deep wrinkles! Pola products are highly effective due to their cutting-edge technology, so it is a brand that Japanese women trust and would use if they can afford it. If you do not believe in the effectiveness of Pola products, you can conduct the experiment of applying Pola skincare products on only one side of your face for a few years like this man did. Prolonged use of effective skincare products really does make a difference. As Pola Wrinkle Shot Medical Serum is a serum and not an eye cream, it is recommended that you apply eye cream on top of the serum to form a barrier and lock in the goodness of the serum for best results. This serum can be applied on any wrinkles on the face such as the forehead and around the mouth. b.glen Total Repair Eye Serum is not sold at the counters in Japan as it is only sold online. Many Japanese skincare brands only operate online, so if you are wondering why it seems like Korea has many more skincare brands than Japan after visiting both countries, this is the reason why. Eye Regener: An extract rich in oligopeptides and oligosaccharides which is derived from alfalfa to firm up the skin. Skinmimics: A combination of ceramides like Ceramide NP, Ceramide NS, Ceramide EOS, Ceramide EOP, Ceramide AP, Caprooyl Phytosphingosine, and Caprooyl Sphingosine which helps to promote the formation of lipid and creates a protective film on the skin which protects the skin from drying. Chronoline: HGF (hepatocyte growth factor)-like synthetic peptide present in the human body which prepares the foundation of the skin to make skin look more youthful. IGF-2: IGF (insulin-like growth factor) synthetic peptide present in the human body which gives elasticity to the skin. EDP ​​3: Synthetic peptide that supports the original force of the skin. It will promote skin turnover that tends to be delayed with age. α-glucosyl hesperidin: Flavonoids with vitamin P-like action contained in citrus peel. It makes the skin appear lively. 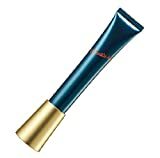 b.glen Total Repair Eye Serum contains the brand’s patented technology called “QuSome” which was initially developed for the purpose of drug delivery in the medical industry. The technology micro-encapsulates the ingredients so active ingredients can penetrate deep into the skin for maximum effects without irritating the skin. As the ingredients are released slowly into the skin, the skin can benefit from long-lasting effects. This product not only works for eye wrinkles but also for other skin issues around the eye area such as dark circles, sagging, and dullness. The change that many users have remarked are that their eyes appear bigger after using this serum due to the lifting and firming effect of this eye serum. Pola Signs Shot is another wrinkle serum that is designed to not only be applied around the eye, but also on any other areas where you are concerned about wrinkles such as the forehead and around the mouth. You can surely apply this on your whole face too. While you can use this serum alone, it is recommended to apply an eye cream after using this serum around your eye area for best results. Pola Signs Shot works to lift and reduce wrinkles. Its Stretch-fit Veil also makes the skin feel firmer. Many Japanese users have remarked that there is a definite improvement in skin elasticity after using this serum. Besides that, it helps to reduce fine lines especially those that are caused by dryness. Munoage is another brand that is not popular outside of Japan. You can place your trust in this brand as it is developed by dermatologists who have examined the skin of more than 6000 patients. Those dermatologists are specialized in improving aging skin that has issues like pigmentation, sagginess, and wrinkles. Munoage Repair Eye Cream is popular among women in the 30s and 40s in Japan because it really firms up the undereye area. In January 2017, this eye cream ranks first on Amazon Japan. The eye cream features 7 types of peptides which are great to improve the undereye area and the skin around the mouth. This eye cream contains no fragrance, artificial dyes, preservatives or parabens, mineral oil, alcohol, or petroleum-derived surfactants. Shiseido is a popular brand around the world and it remains popular for so many years because the brand produces high quality skincare products which are very effective. Shiseido is a very reliable brand so you can’t go wrong with its eye creams. 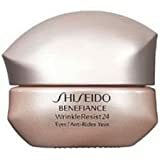 Shiseido Benefiance WrinkleResist 24 Intensive Eye Contour Cream has been a popular eye cream for many years and deservingly so. This is because it is one of the few eye creams that actually produces results! Plus, it is widely available so you can easily find it in stores. Shiseido Benefiance WrinkleResist 24 Intensive Eye Contour Cream is formulated with WrinkleResist24 technology (formulated with Chlorella Extract, Mukurossi Extract and Gambir Extract), Burnet Extract, and Super Bio-Hyaluronic Acid N that improve wrinkles, firmness and hydration. This is a rich and hydrating Japanese eye cream that plumps up your skin and minimize the appearance of fine lines under your eyes. It also helps with dark circles so you will look more awake. Many users reported that this eye cream produces results quickly so it becomes a cult favorite! Shiseido Ultimune Power Infusing Eye Concentrate’s popularity in Japan has been rapidly increasing since its launch in 2015. This product is not actually an eye cream, but it is to be used before an eye cream to boost the benefit of the eye cream you are using. Hence, it is kind of like a concentrated serum for your undereye area. Shiseido Ultimune Power Infusing Eye Concentrate contains the patented Ultimune Complex™ and ImuMoisture Extract™ to strengthen the skin against signs of aging. It also contains Gingko Biloba Leaf Extract, Shiso and Thyme to maintain healthy skin and protect against impurities. This eye concentrate works great to soften the fine lines under your eye. It also brightens the eye area so you will look fresh and healthy! Use it in conjunction with an eye cream to obtain marvelous results! DHC Retino A Essence was released in 1999 but its popularity is unwaning which means that this eye cream really works for many people. After all, this product contains retinol which has been long established as an effective wrinkle fighter. Retinol is derived from Vitamin A. It is an ingredient that boosts collagen production and speeds cell turnover which leads to smooth skin. As a result, your skin will be firmer and smoother with reduction in fine lines and wrinkles. DHC Retino A Essence is highly recommended to those who have mature and sun-damaged skin. Even those with sensitive skin can use this mild product. As retinol takes time to work, you need to use this product for some time to see good results! If you are looking for an affordable eye cream to moisturize your undereye area well, then Meishoku Placenta Whitening Eye Cream is your best bet. It is a best-selling Japanese drugstore eye cream that has good cost performance and tons of good reviews on Japanese sites. Meishoku Placenta Whitening Eye Cream contains concentrated placenta, collagen and barley extract which penetrate deep into the skin to firm up the skin. The eye cream also works to suppress the formation of melanin which leads to a brighter eye area. Meishoku Placenta Whitening Eye Cream comes in a 30 ml tube so you are getting a lot of the product. It is a thick eye cream that claims to reduce dark circles and reduce fine lines. This product really works well to hydrate the area under the eye so if you have fine lines as a result of dehydrated skin, this eye cream will plump them up very well! I would recommend this eye cream for those with young skin and are not highly concerned about anti-aging. Next story Best Korean Toner Without Alcohol Suitable For 7 Skin Method!